Lucas Oil Racing TV pro Hector Arana Jr. has piloted great motorcycles in the past, finishing second-through-fifth in the final world rankings in five of his six pro campaigns, but he says he’s never started the Countdown to the Championship playoffs in as good a position as he will this year. 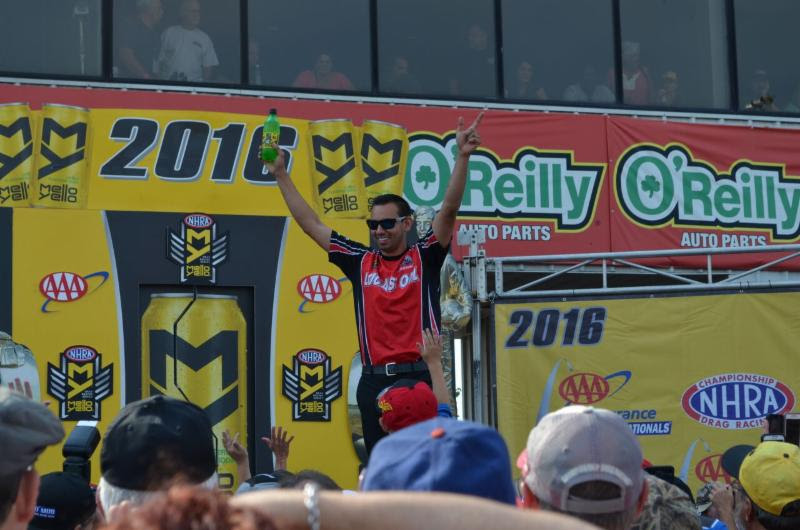 Arana begins his seventh quest for ultimate Pro Stock Motorcycle glory this weekend at the 10th annual NHRA Carolina Nationals as the third-ranked rider in the class, meaning he’s just 30 points — or the equivalent of one and a half elimination rounds — out of first place. Considering he’s coming off his third runner-up result of the season, he has every reason to be excited. “We’re peaking at the right time, which is something we’ve been working towards all year,” Arana said. “The most important thing is we have a consistent bike. We might not be quickest or the fastest every single round but over the course of most weekends we definitely are the most consistent. Arana’s best finish in the points came in his rookie season of 2011 when he ended up second overall and was named Auto Club Rookie of the Year. He finished third in 2012 and 2014 and was fourth overall in 2013. Last year’s eighth-place result was his lowest finish in the final points. “In year’s past there always seems to have been something we were struggling with, whether it was the engines, the chassis or some other kind of issue,” Arana said. “This year, with Dad (teammate Hector Arana Sr.) not racing since he had shoulder surgery, he’s had a lot more time back at the shop getting our motors in order and keeping my Buell in perfect working order. As Arana sees things, he is one of six bikes that can realistically win it all. “You have the two Harleys and the two Alligator bikes plus Matt Smith and me,” Arana said. “Those are the bikes I see as the true contenders. It all starts this weekend and as Jim (Yates, crew chief) would say, the Countdown is a chess game. The first move sets up the rest of your moves, so you want to make a good first move.